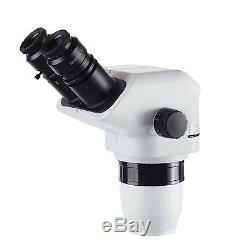 AmScope ZM6745NB 6.7X-45X Binocular Stereo Zoom Microscope Head w Focusable Eyepieces. Please note that we cannot honor warranties for other sellers' products! 6.7X-45X extreme widefield continuous zoom magnification power. Sharp clear stereo erect images over an extreme wide field view. Focusable extreme widefield high-eyepoint WH10X/22 eyepieces. 48mm (in diameter) female thread for adding Barlow lenses or lights. Mounting Size: 3 (76mm) in diameter. This 6.7X-45X zoom magnification binocular stereo microscope head offers top-level sharp clear erect stereo images over a large zoom magnification range. It includes a pair of extreme widefield focusable WH10X/22 eyepieces. Its outstanding optical system ensures an easy and comfortable observation. This microscope head fits all the stands with a 3 (76mm in diameter) O-ring holder. 6.7X-45X Continuous Zoom Magnification Offering Top-Level Quality Images. High Quality Extreme Widefield Focusable WH10X/22 Eyepieces. Both Ocular-Tubes with Adjustable Diopter. Accurate Alignment Ensuring a Fatigue-Free Viewing. Manufactured under ISO 9001 Quality Control Standard. Head: 45-degree inclined 360-degree swiveling binocular. Eyepiece: 30mm extreme widefield high-eyepoint focusable WH10X/22. Zoom Range: 6.7:1. Interpupillary Distance: 2-3/4" - 2-15/16"(47-75mm). Field of View: 1-3/8 (35mm). Head Mounting Size: 3 (76mm) in diameter. Accessory Mounting Size: 1-7/8 (48mm female thread) in diameter. One Binocular Stereo Zoom Head. One Pair of Extreme Widefield WH10X/22 Eyepieces. One Pair of Foldable Eye-Guards. We thank you for your patience while we work on your request. The item "6.7X-45X Binocular Stereo Zoom Microscope Head w Focusable Eyepieces" is in sale since Thursday, March 07, 2013. This item is in the category "Business & Industrial\Healthcare, Lab & Life Science\Lab Equipment\Microscope Parts & Accessories".